Backend Engineer at trivago. Likes just-in-time compilers and hot chocolate. About me. My website is reasonably fast. There was one thing left, which really annoyed me: layout reflow after images got loaded. The problem is, that the image dimensions are not known when the text is ready to be displayed. As a result, the text will be pushed down on the screen as soon as an image is loaded above. I vaguely remembered, that Facebook uses tiny preview thumbnails in their mobile app. They extract the quantization table from the JPEG header to render the preview. This information is stored on the client, so it doesn't need to be downloaded every time. Unfortunately, this approach requires full control over the image encoder. It works for apps, but hardly for websites. Until my colleague Tobias Baldauf introduced me to LQIP (Low-Quality Image Placeholders). Load the page including inlined, low-quality image thumbnails. Once the page is fully loaded (e.g. when the onload event is fired), lazy load full quality images. I used different tools to create the thumbnails. For JPEG and PNG encoding, I used svgexport. 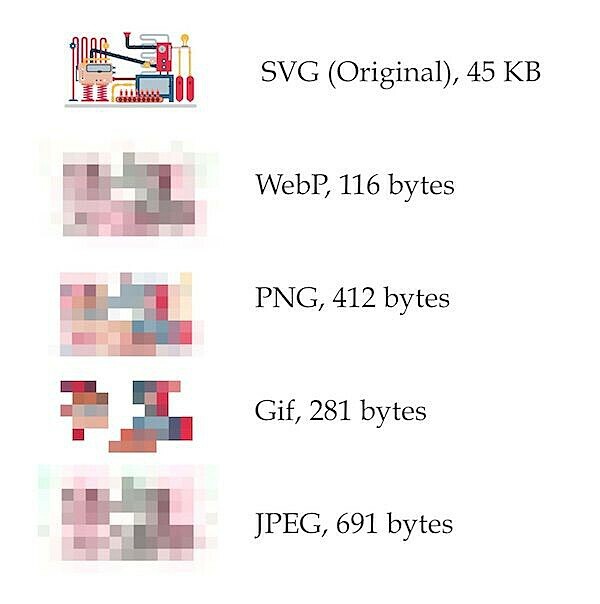 WebP is the smallest, but it's not supported by all browsers. Gif was second, but when resizing the image and applying the blur filter, I was not happy with the result. In the end, I settled for PNG, which provided an excellent tradeoff between size and quality. I optimized the images even further using oxipng, which supports zopfli compression. With that, I end up with thumbnails of around 300-400 bytes in size. I integrated the thumbnail creation process into my build toolchain for the blog. The actual code to create the images is rather boring. If you really want to have a look, it's on Github. I wrap the SVG into an object tag instead of using an img element. This has the benefit, that I can show a placeholder in case the SVG can't be loaded. I position the object at the top left of the loader div. The last part is the handling of the thumbnails. Like most other sites, I decided to apply a blur filter. In a way, it looks like the image is frozen, so that's what I called the CSS selector. I also applied a scaling transformation to achieve sharp borders. The duration of the animation is based on the 95% percentile load time of all visitors of the page. Although it's just an approximation, this should work for most readers. Go vs Rust? Choose Go. I'm a Backend Engineer running Hello, Rust!, a YouTube channel about the Rust programming language. On this blog, you'll mostly find articles about programming in Rust and Go or developer tools like make and Vim. We should hang out some time. It'll be great.